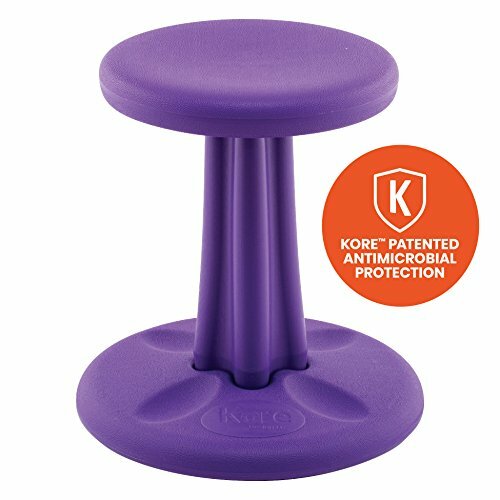 ★ ANTIMICROBIAL | Now with Kore™ Patented Antimicrobial Protection: Kore™ Kids Wobble Chairs now include antimicrobial protection against the spread of common bacteria. Kore™ Kids Plastic Wobble Chairs are now manufactured with a patent-pending, FDA approved SMART PLASTIC Antimicrobial, which offers broad-spectrum protection and has been successfully tested to reduce up to 99.9% of common bacteria including E. coli, listeria and S. aureus. ★ IMPROVE POSTURE | Ergonomically designed, the Kore™ Wobble Chair transforms the conventional boring seat into a playground for your child's imagination. The innovative Kore™ Wobble Chair encourages active sitting and allows one's knees, hips and back to find comfortable and ever-changing positions. Ideal for children of all ages, sizes and heights. Provides an outlet for all high-energy children. Makes a great STEM flexible seating option. ★ SUPERIOR FOCUS | Kore™ Wobble Chairs increases secondary focus. Continous movement while sitting relaxes the right side of the brain, leading to better focus. Helps people that are diagnosed with all forms of ADD, ADHD, and Autism as it provides them an outlet to move around without distracting other students or co-workers. ★ SAFE | A patented anti-roll saftey ring on the base prevents tip-overs and falls. The gentle-rounded base is stable, moves with child, and rests naturally upright. Ideal for all children thanks to fixed height options from 10" to 18.7". ★ MADE in the USA | Proudly American - All plastic Kore™ Wobble Chairs are manufactured in the USA. Kore™ Wobble Chairs are available in all 50 states, Canada and Europe. Kore™ offers a limited LIFETIME WARRANTY!